The Mayans are not just famous for their architecture, temples, and pyramids--they also enjoyed having cute little monsters as pets that are much happier in the darkness. And they need your help to ensure their environment doesn’t get too bright! You just need to match 3 or more monsters of the same color, sliding the temple chambers in order to leave them living in peace in the darkness. You score points by combining 3 or more monsters of the same color. To do this, you can slide the columns and rows up, down, and sideways to line the monsters up, but be careful because you can only do that 60 times! By removing the monsters from the lighter tiles, you level up. 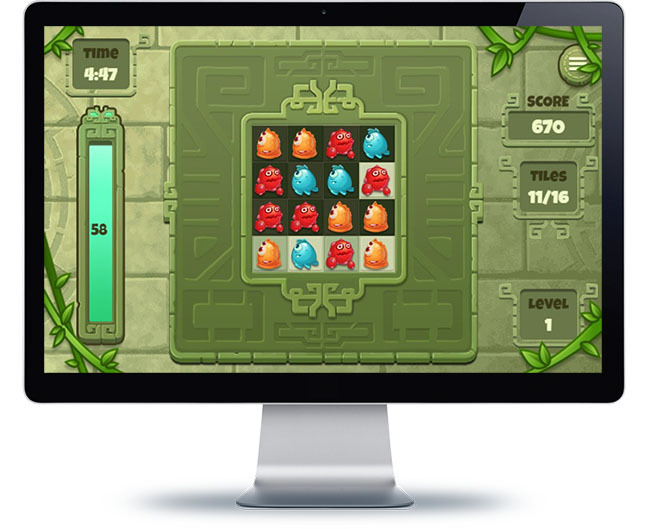 In the higher levels, there are more monsters, more colors, and the opportunity to score more points per monster.